Ah, animals: they’re cute but also shootable. An eternal dilemma. Games like theHunter, a free to play hunting sim, try to solve this by giving us the opportunity to shoot animal-shaped pixels instead of the living, breathing versions. It’s made by Expansive Worlds, a subsidiary of Just Cause developer Avalanche Studios. Tired of the real world? Here’s our picks for the best simulation games. 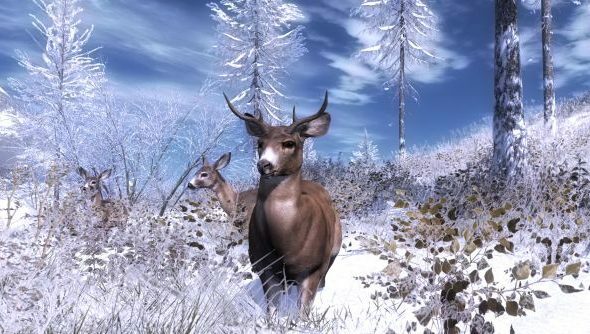 The snowy area, named Whiterime Ridge, was added in response to community requests for a less lush wilderness to go a-huntin’ in. The environmental effects aren’t just for show, with the cold slowly degrading your performance and eventually killing you if you don’t wrap up warm and stay healthy. A change of locale also means new animals to hunt and these come in the form of the Snowshoe Hare, Bison, Arctic Fox and Sitka Deer. It’s the first time bovine creatures have been added, and the old hunter-favourite Moose will also show up. Whiterime Ridge is available now in theHunter, which you can play for free right hereor on Steam. Any hunter-sim fans out there?